This week I had the chance to play around with the telescope due to some nice clear skies. Unfortunately the moon is also in the waxing gibbous phase, making seeing much difficult. However I still wanted to go checkout the site I had picked out. So on Thursday, Kim and I drove up to Henry Coe State Park and setup the telescope. 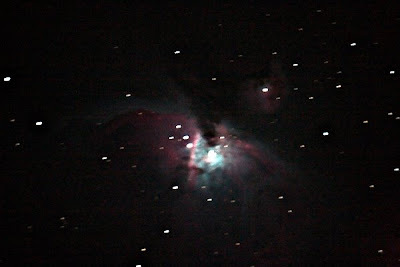 The Great Orion Nebula was very nicely visible (we also managed to see Saturn and Mars). However you can see there are many problems with this image, mostly my fault including: forgetting to use the focal reducer, forgetting to reset the diopter on the camera, and not getting perfect polar alignment. However, these are things I can fix, and hopefully next time will be better. I also hate trying to focus with the 20D. I want to see if I can do better with either the 5D or the 20Da. Technical Specs: Canon 20D, 8" LX90 (prime focus), 12s, ISO 1600.